For Václav Chad Gallery in Zlín, Václav Cigler and Michal Motyčka have prepared an installation called Prisms and Cylinders, which will present the authors' common thinking on many levels, from the sensory experience of perception of the space to the understanding of implicit symbolic meanings and optical changes of glass sculpture in the gallery environment. The exhibited works are transparent bodies, elementary forms of prisms and cylinders of optical glass. They create feelings and architectural relationships by using composition-based compositions, changing the perception of the horizon and on the principle of gate composition. The horizon defined by the viewer's view varies with different angles of skew angles. At the gate, the edges of the two oblique blocks converge to the center to form a narrow slot. Light transforms the shapes of objects, radiates and distorts their exact forms. Authors through the installation strive to change the perception of the viewer's space. Václav Cigler and Michal Motyčka represent prisms and cylinders made of optical glass, which accurately formulate the space and develop a minimalistic story of shape - symbol - with the visual presence of the viewer through visual installation.They deal with the issue of optical imaging, but also a more serious reflection on the nature of light and the perception of color, to put it simply, they experiment with our senses. 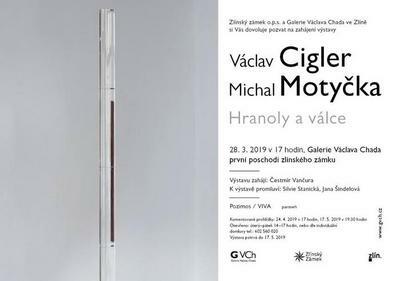 You can admire the works of Václav Cigler and Michal Motyčka in the Václav Chad Gallery until May 17, 2019.